There are many trustworthy crating and shipping companies in New York City, and we already wrote about some of them in our previous blog posts. However, when it comes to transporting art, antiques, and other objects of exceptional value at a reasonable price, Fine Art Shippers is your best option! As professional shippers of fine art, we provide art business professionals and private clients with all possible art logistics services, including such crucial steps of the transportation process as in-house crating, custom packaging, and art storage. 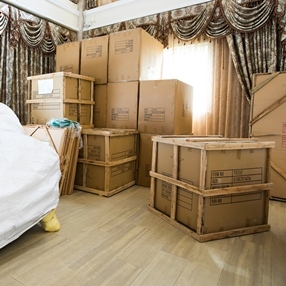 Moreover, even though Fine Art Shippers is one of the small, family-owned crating and shipping companies in New York City, we have all the needed equipment and knowledge to handle even large and challenging orders, such as moving the entire estate and shipping oversized sculptures. Besides, it gives us an opportunity to offer all our services at affordable prices, making them a preferred option for many art galleries, auction houses, artists, and collectors from all over the world. It is also worth noting that just like large crating and shipping companies in New York City, we operate both nationally and internationally, providing our clients with customized solutions to any shipping problem. Our packaging solutions are based on a whole range of factors, such as the item’s dimensions, fragility, weight, final destination, and the best mode of transport for its safe and secure transportation. What is no less important, we use only high-quality packing materials to ensure that every single piece is properly protected throughout the entire shipping process. Being one of the best crating and shipping companies in New York City means to provide a comprehensive crating service in-house, and this is exactly what we offer our clients at Fine Art Shippers. Moreover, our team of experienced crate makers can build a variety of customized wooden crates to meet the specific needs of diverse works of art, ranging from small and delicate items to large statues and sculptures. At Fine Art Shippers, we can ship just about anything to anywhere! We do not have size and weight limitations, and we can equally deal with small and big shipments. Thereby, whether it comes to a single painting or a collection of outdoor sculptures, our team can offer the most efficient and cost-effective solution tailored to meet the client’s needs. All of the above makes Fine Art Shippers one of the best crating and shipping companies in New York City and beyond, so feel free to contact us anytime you need professional art shipping help!